In an ideal world, no Canadian would have to wait for health care. In fact, in many European countries, patients don’t have to wait for high quality, publicly-funded health care. As physicians, Wait Time Alliance members and partners see first-hand the impacts that long waits have on patients. When long waits exist, conditions can worsen and patients face an increased risk of complications that have the potential to require more invasive treatment and follow-up. That’s not to mention the stress that long or uncertain waits cause for patients and their families. Ten years later and considerable money spent, and Canada has seen a lack of consistent progress in reducing these wait times. The piecemeal approach to address wait time issues has meant that not enough attention has been paid to addressing the entire health care system or a patient’s journey through it. Beyond this, the Wait Time Alliance works to inform policy and hold governments accountable to the commitments they have made through our annual report cards. The Wait Time Alliance also offers to assist governments to help implement additional benchmarks to improve access to a broader range of treatments, procedures and diagnoses. It seems like most officials have no idea whatsoever of what it’s like to face an indefinite wait. Patients have an important role to play, too. The Wait Time Alliance believes that everyone must work together to advocate for an improved health care system—governments, providers, and patients. 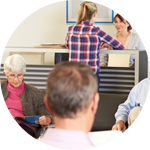 The Wait Time Alliance’s Patient Advisor brings a formal patient perspective to our efforts. What can you do if you are facing a long or uncertain wait for treatment? Get informed. Know what wait times are in your province or territory, take a look at the Wait Time Alliance benchmarks and determine what an acceptable wait for your treatment is, and then, become an advocate. Together, we can let our governments know that they can do better. Don’t forget to congratulate your elected representatives and health care providers when you have received timely access to care!